Kale is an incredibly healthy green and lucky for me, I actually quite like it. Most of the time we eat it just baked in the oven with some sea salt, like kale crisps. They get devoured very quickly at our house and are made two to three times a month. I like kale crisps but I wanted to use kale in something else other than just crispy leaves. I find a lot of soups and stews that use kale but I am not very fond of the chewiness of kale in that preparation. I decided on a kale and feta pie, like a spanakopita but with kale instead of spinach. It would have been easier to make the pie, but I figured the children would like the rolls better because they are neat little packages and everyone gets their own and it’s not as messy. 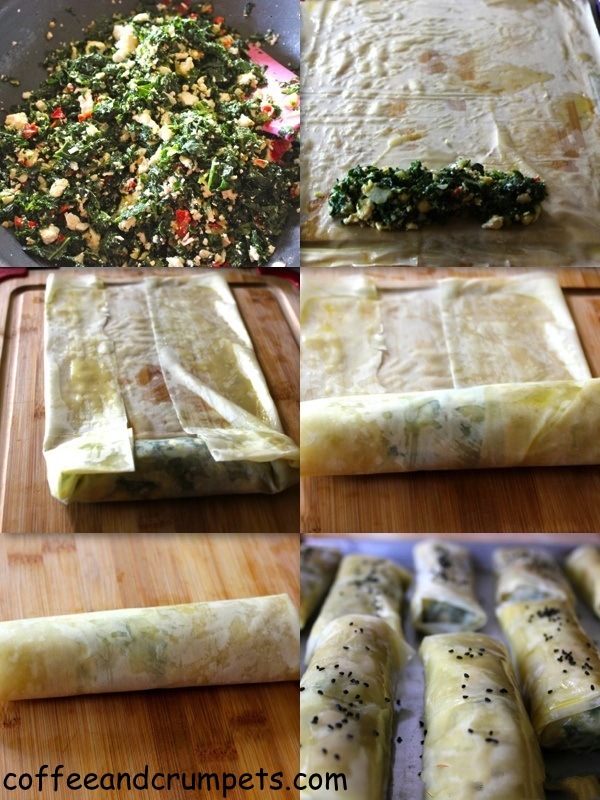 They were not too difficult to roll as long as they were moistened with some olive oil. I used a little bit of butter with the olive oil, but not to much so that I defeated the purpose of eating those greens! Like in my Potato-Cheese Phyllo Pie, I prefer to use a thicker phyllo dough for my pies and rolls. I do not have the patience to deal with the very thin sheets. This thicker dough does not dry out as quickly and you can actually separate the sheets without it tearing and drying out. Lately, I have even making my phyllo/strudel dough by hand. I experimented with strudel a few months back and found out how easy strudel dough is to make. The tricky part is the rolling out, but with practice, it’s not a challenge. 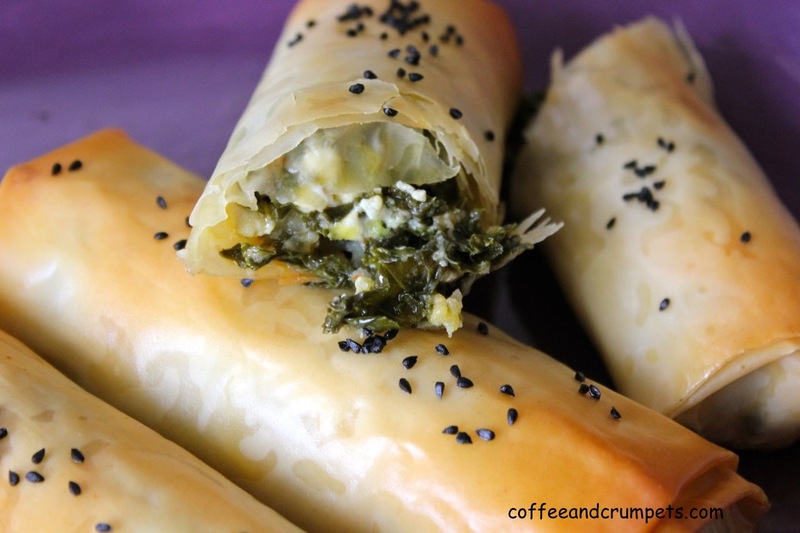 So, the filling for these phyllo rolls was sautéed kale with green onions and some feta. I added this great condiment I found, an Italian hot garlic and pepper sauce, which added a nice garlicky kick to the kale. You can omit this or add some other hot sauce. Another thing I like in my phyllo pies is potato. To me, the potato adds a creaminess and a softness to the crispy, chewy roll. It also helps keeps the salt in check with the Feta. You can leave the potato out but I think it adds a great dimension to the dish. The box of phyllo dough I buy has about 10/11 sheets. This makes 10 rolls. Once the kale begins to cook down, add the scallions and let the liquid evaporate. The mixture needs to be dry so it can be rolled in the pastry. Once the mixture looks dry, add the garlic pepper sauce if using or hot sauce. Once mixture is cool, crumble the Feta into the kale mixture and mix in the potatoes. Check for salt after adding the Feta otherwise it will be too salty. Adjust seasonings, salt, pepper, hot sauce and lemon juice to your liking. You will need to brush a little more butter/olive oil to allow the pastry to stick and became crispy and layered when baked. Fold up the sides and continue rolling into a cigar shape. Repeat with the rest of the sheets. Sprinkle the top with some black nigella seeds. Place in the oven and bake for 30 minutes or till rolls are crispy and golden brown on top. These came out delicious and were quickly polished off at the house. 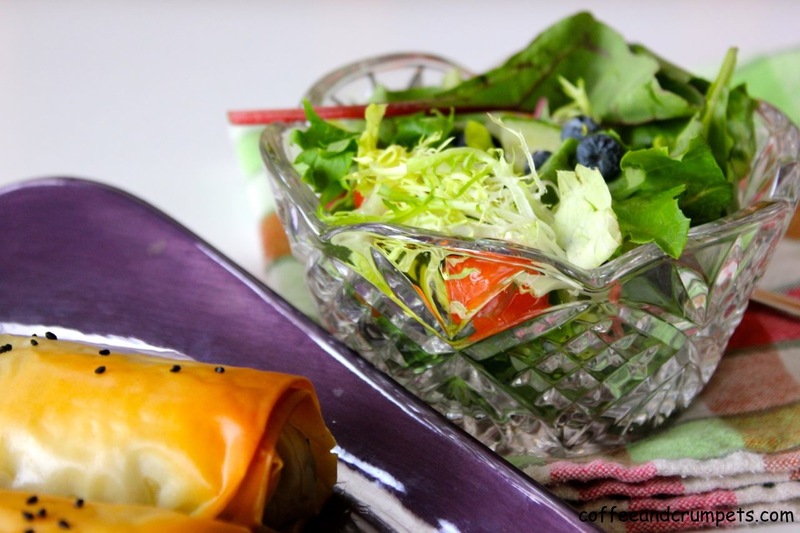 They are more substantial then just a spring roll and great for lunch, dinner or appetiser. We had them with a green salad for dinner. Two of these rolls makes a filling dinner. So, now I have one more thing to make with kale that I will eat! How about you guys? Do you all have any weird issues with texture or smell? I am going to leave you with a picture of the Colorado state flower, the beautiful blue columbine, which I captured on camera at the Golden Gate Canyon State Park on Sunday. I am going to make this one day soon. I love it. 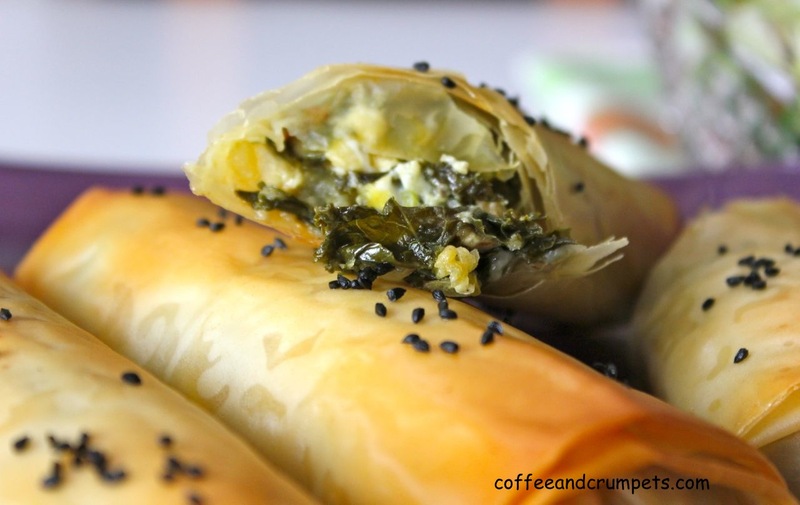 I love all the ingredients in it and it’s brilliant how you roll them up in phyllo! This looks delicious and I bet it’s hard to stop once you start eating these. Thanks Nami! They did turn out better than expected. I do hope you try them. Those rolls are absolutely brilliant!! Just look at how thin and crispy they look! Had some badly rolled out sushi for lunch with the kids today, so just looking at these is making me hungry. 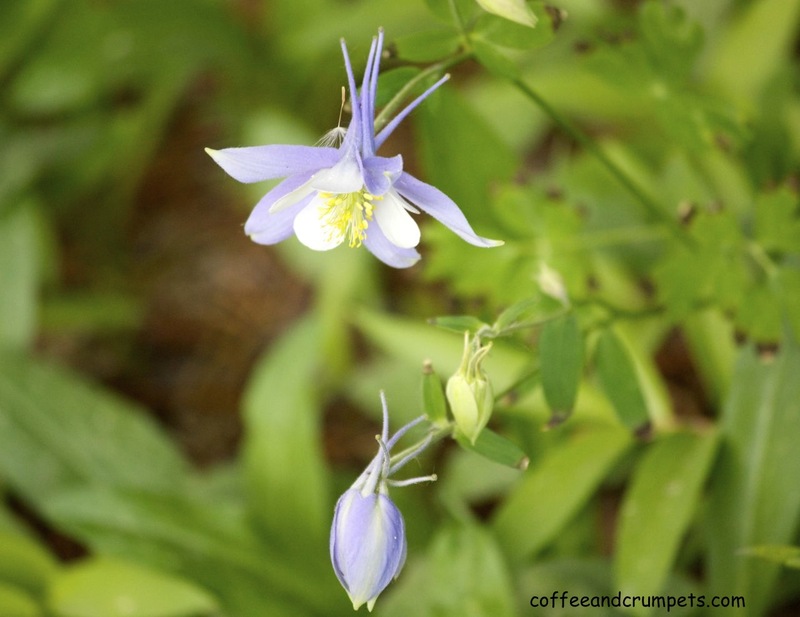 The blue columbine looks breathtaking…. Thank you Minnie! I don’t like kneading chapati dough or rolling them out either, they make such a mess and the flour gets everywhere. Needless to say, we eat very few parathas and chapatis even though I love them. Phyllo dough is easy compared to the roti dough! Less mess. I have a a lot of issues with greens, but love cabbage and methi. I am trying to get used to all the other American greens, I just started preparing them Indian style! My husband, who is Macedonian, will absolutely love these. 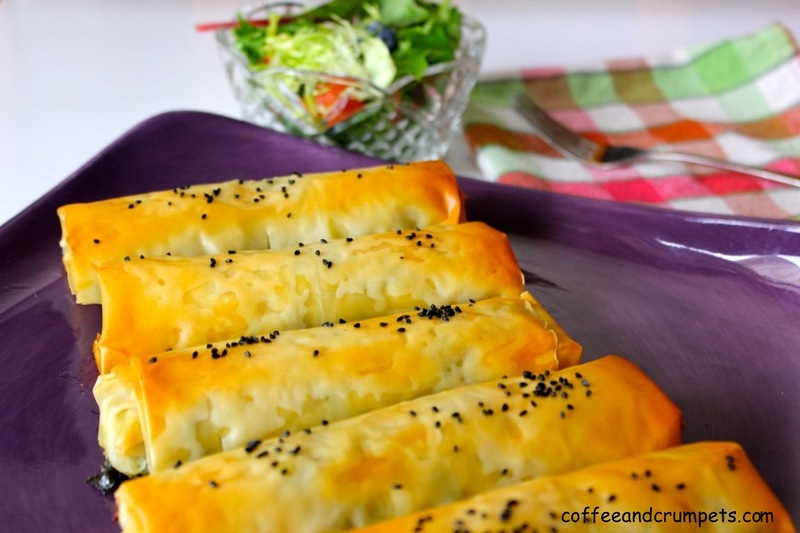 This is a lovely variation for phyllo rolls. Thank you so much. Thank you Victoria! I have to find creative ways to eat my greens! I keep trying to convince myself that I like kale but I’m not winning the battle. I might substitute something else because these rolls are to die for beautiful. I find it very hard to convince myself that I can eat all kinds of greens. The best way to try kale is to bake them with a little sea salt. They are crispy and delicious. Thats about the only way I can down this! These were good though so I might make them again. Thank you for the compliments! These look absolutely delicious! I’ve never tried kale before but I was told it’s very healthy and heard so many great things about it. I’m very curious about its texture, taste, smell, etc… and wondering if it tastes like lettuce!! Next time I will pick some up on my grocery and give it a try. Thanks for sharing. Have a lovely day. Thank you Mamat. It doesn’t taste like lettuce but it’s fairly mild compared to other greens. I like it just baked crisp and if you’ve never tried it before, that’s the way to do it first time. I hope you try some! They look gorgeous! I think I would prefer them even over the Eton Mess 🙂 I have had very bad experience with kale (it was very very organic and I spent hours trying to remove bugs and finally threw the whole thing away) and have never tried cooking it since then. You have made me crave it again! Thank you Sissi. That is one thing I don’t like about any sort of greens, the dirt and the cleaning. Takes a while to get them washed and spun dry in my salad spinner. These turned out really well and I was quite happy. I made them spicy too so there was a nice kick to them. Hope you try kale again and good luck with the bugs! I don’t have any kale in my garden but think I could use Rainbow chard instead. These sound and look delicious! Oh yeah…chard would work just as well. I can handle one green a week only! Hope you try them out. They were good. I love this recipe! I started using kale a while ago, I am experimenting with the greens that i find here in North America, because back in Greece we have a huge variety of greens and we use them in many many recipes. I like Kale, day by day I feel more comfortable with it. Your rolls though are just perfect! Isn’t that the truth? Every where you go, they have their local or seasonal produce and that’s what you grow up eating. I didn’t eat chard or kale growing up, it was mainly spinach and fenugreek leaves my mum would buy from the Indian grocers in London. I never even heard of half the greens till I moved here and started cooking. I am learning that most greens, at least, can be used in the same preparation as the greens that you are accustomed to…hence my Indian versions!Thanks for stopping by Eri!